Good news for big flashlights lovers! Newest premium LED Torchlight JetBeam DDR30 is available in our online store at the best price! 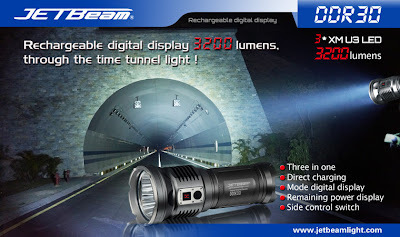 JetBeam DDR30 is rechargeable torchlight with digital display. It has three CREE XM-L U3 LEDs with high lightness up to 3200 lumens. It is under the patent protection of JETBeam’s unique digital display of the brightness and the remaining power level. With the display function, the users can see the mode and remaining power clearly at any time. DDR30 uses three 18650 batteries. Batteries cartridge can be loaded into flashlight from eather direction. Also DDR30 can be charged directly with Built-in charger from AC or car adapter. It offers three brightness levels and one strobe mode with an easy operation regulation of side control switch. DDR30 extended the classic of RRT3 and became another miracle rechargeable digital display three-headed flashlight of 3200 lumens. Powerful, durable, waterproof, handy... The best ever! You can buy JetBeam DDR30 in our online store just now with lowest price $239.99! Limited offer!